Nothing beats the versatility of an Oscillating Spindle Sander for smoothing curved edges, and when space is limited, you'll really appreciate this benchtop version. With its large table surface and six different sanding drum diameters stowed neatly under the table, the right sanding drum is a quick change away. 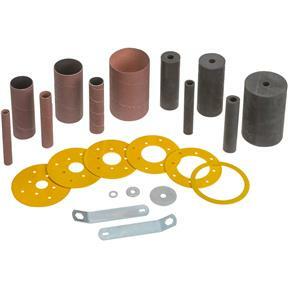 Includes spindle wrenches, table inserts, and a 2-1/2" dust port. Approximate shipping weight: 36 lbs. So far so good, I got this for Christmas and saved several shaping projects until it was set up in my shop. Shaping hardwood has always been one of those jobs i dislike but this tool brings even that job into the realms fun equal to my other woodworking tasks. Easy to set up easy to use. . 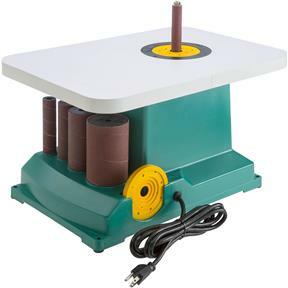 Prior to purchasing this Spindle Sander, I had used a sanding drum attachment on my drill press. This tool is so much more convenient. I have had it operational now for a couple of weeks and have used it on 3 projects already. The sound level is as good as the drum sander on my drill press. I especially like using the sander with a clamped on fence to hone in the thickness of thin pieces of wood. I plan to add a more permanent fence once I come up with the design. I bought this machine to replace one that had seen better days. This machine does a better job, which surprised me, and has full met my expect ions . All the machinery that I have purchased from Grizzley has been quality products. I bought this machine to replace an old Ryobi spindle sander of the same design, that had finally given up the ghost after years of faithful service. 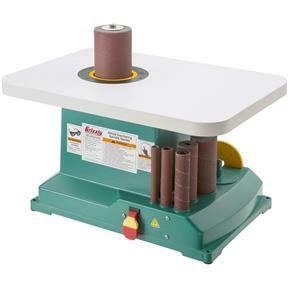 The Grizzly G0538 is the only spindle sander of this design that I know of now. I hope Grizzly keeps this machine in the lineup for a long time, because it is so jig-able. I jigged this sander up with an adjustable hinged fence, which enables me to thickness sand small parts, like binding strips, bridge blanks, and even headstocks for the guitars I build. It is ideal for this purpose, as well as the regular shaping operations you use a spindle sander for. In order for it to work well as a thickness sander, the spindle has to oscillate with ZERO wobble; and this one runs true. My parts come out the other end at perfectly uniform thickness. A couple other pluses with this machine are, it runs much quieter than my old Ryobi; and the dust collection port under the table works really well with a shop-vac or 3 dust collector hose attached. I use this machine every day, for all sorts of shaping and thicknessing operations, so, yeah, Im definitely getting a lot of bang for the buck out of this one! Great machine,it has been working very steady since purchase. provides a quick and easy way to do finish sanding. I used one of these at a friends home. He had a harbor freight oscillating sander and returned it because of the loudness of the motor. The G0538 was nice to work with and I like the one I purchased. 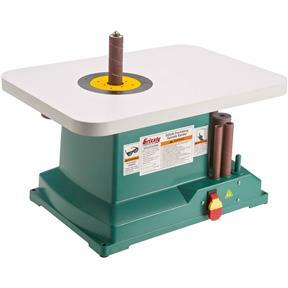 I purchased my spindle sander a couple of days after Christmas and have used it continuously since. For making patterns, it is essential. You can glue the pattern to the wood, cut it out on the band saw, leaving the line, and sand to the line and virtually split the line. You can control the wood so much easier than using a disc sander or belt sander. I highly recommend the product and like all of my other Grizzly tools, performs great. purchased it. The machine works very well and I intend to keep it and use it. I dislike plastic. I hate sanding and this little machine helps me get through the process much easier. It really is a good machine for what it is made to do. With so many sizes available to choose from there are many choices to sand with the spindles. Good machine! I bought this to replace an older sander by another company because it had the same size table and all th jigs I made work on this new one. The Grizzly model is much quieter and smoother so I couldn't be happier with it. I did a lot of searching before purchasing this sander. I needed this machine for a very specific job in my shop and I was not disappointed! Very solid and well built, should serve me well for years. Works great easy to use and I so glad I got it. I really like this sander. It;s quiet, works well, and dust collection is very efficient when attached to my shop vac.